Sisal (Agave sisalana Perr) is monocotyledonous plant that belongs to the Agavaceae family. Sisal is a native plant of Mexico’s Yucatan peninsula. A. fourcroydes produces a similar fiber called henequen. These belong to the hard fiber group. Sisal is used mainly in twine and ropes. New applications are emerging for, especially in speciality paper, filters, geotextiles, mattresses, carpets and wall coverings. But also in composite materials. The by-products from sisal fiber extraction is used for producing bio-gas for electricity production. Research is also being conducted to explore the use of sisal sub-streams in the production of pharmaceutical ingredients. Sisal is a hardy tropical plant that can survive in a variety of warm climates, including areas with little rainfall and unsuitable for other crops. Sisal is cultivated for its fibers in Brazil, Tanzania, China, Cuba, Kenya, Haiti, Madagascar, and Mexico. In Tanzania and Kenya sisal is predominantly a plantation crop, although some is produced by smallholders. Production in Brazil is largely in the hands of small farmers. Sisal requires very limited use of fertilizers or herbicides. The first stage of the harvesting process is the periodic cutting of the sisal leaves. Then the cut leaves are individually fed into a decorticator in which the pulp material is removed, leaving the fibers. 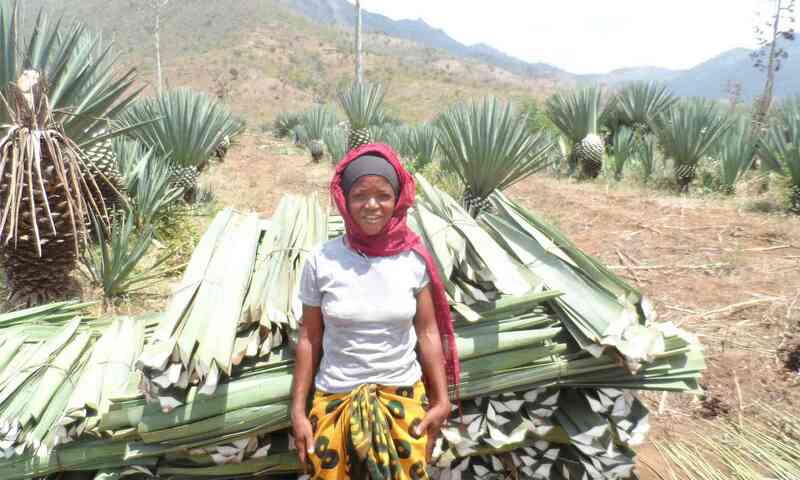 In Tanzania and Kenya processing of sisal leaves takes place in large centrally-located plants. In this system the decorticating machines with running water are used to wash away residues. After decortication the fibers are soaked in water for some time and then sun dried. With further cleaning by brushing to be baled for transport. The world sisal production is estimated at 298.498 tonnes in 2016. The sisal fiber production in Brazil in 2016 was approx. 181.000 tonnes. The Tanzanian sisal fiber production in 2016 was approx. 34.000 tonnes. Kenya produced 23.400 tonnes of sisal fiber in 2016.